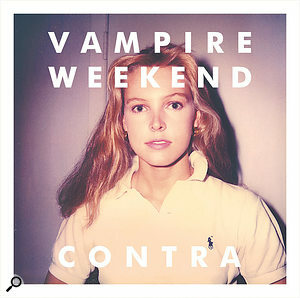 In Contra, Vampire Weekend have made one of the more unlikely US hit albums of recent years. Guitarist Rostam Batmanglij and engineer Justin Gerrish explain how they wowed American audiences with African influences. Justin Gerrish, who mixed 'Cousins', at Avatar Studios in New York. Despite the success of Paul Simon's 1986 album Graceland, music with a strong African influence has rarely filled the hit parades here or in the US. Vampire Weekend have bucked the trend: their second album, Contra, stormed to the top of the American and Canadian charts on its release early this year, as well as hitting number three in the UK, in both cases feeding off the popularity of its lead single, 'Cousin'. The band have described their direct, in‑your‑face sound as "Upper West Side Soweto”. One of the main men responsible for this musical direction is Rostam Batmanglij: as well as being the band's keyboardist, drum programmer, second guitarist, string arranger, engineer, mixer and producer, he also co‑writes most of their material with singer Ezra Koenig. Mixing the album at Avatar. 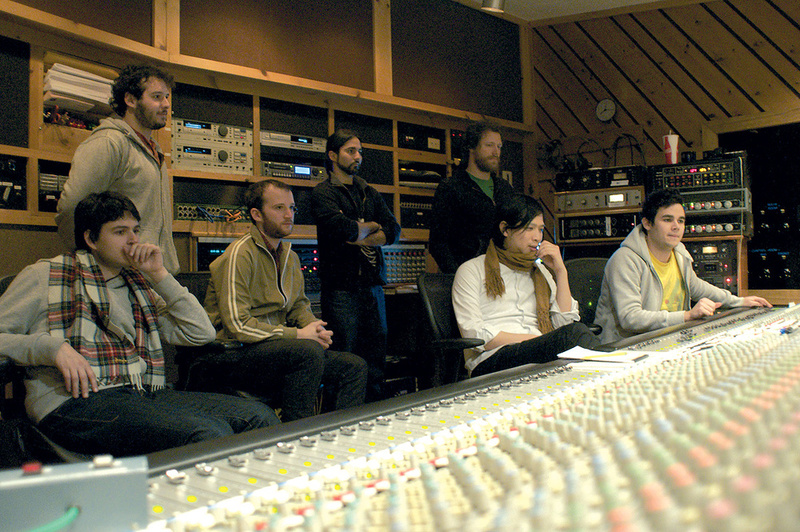 From left: singer and guitarist Ezra Koenig, Matt Herman (friend of the band), bassist Chris Baio, assistant engineer Fernando Loreido, Justin Gerrish, XL Recordings A&R man Kris Chen and Rostam Batmanglij. 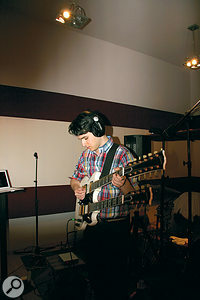 Vampire Weekend's debut album had been recorded by Batmanglij in different places — his apartment, a friend's basement — on Pro Tools LE, often using an M Box interface. For Contra, he wanted to work on Pro Tools HD and, as he didn't then have the money to buy a system (he finally acquired one early this year), much of the hard work for the new album was done at Treefort Studios in New York, which is owned by engineer Shane Stoneback. Before and during the writing and recording sessions at Treefort, the band occasionally dropped in at nearby Avatar Studios — famed for its large, wood‑panelled recording areas and vintage equipment — for rhythm-section tracking and, eventually, mixing. They were helped out at Avatar by young staff engineer Justin Gerrish, who has worked at the studio since 2005, and trained with studio luminaries Rich Costey and Russel Elevado, among others. The Pro Tools Mix window for 'Cousins', with colour‑coded tracks indicating, from left, drums, bass, guitars and vocals. 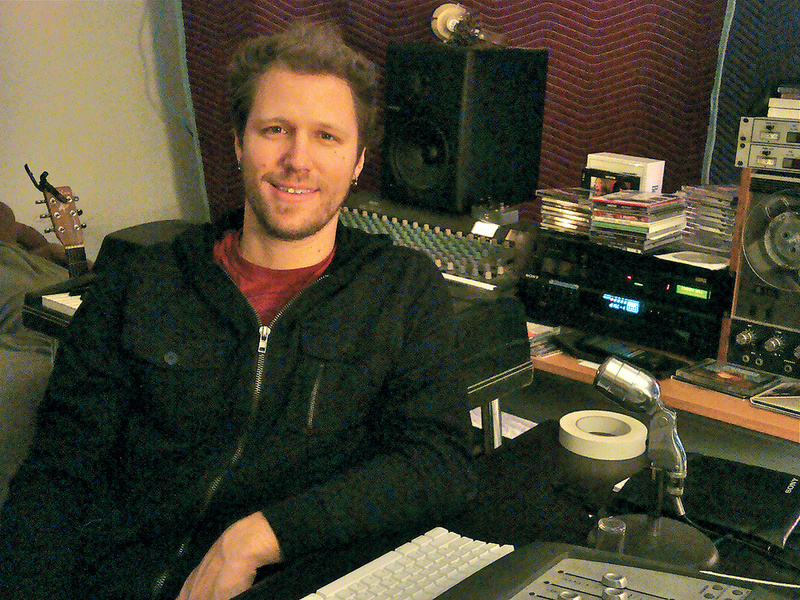 "We didn't use a desk at Treefort, everything went straight to Pro Tools. I had bought a Neumann M149 when we started recording, and we also had a Neumann TLM103. These were our two main vocal mics. We also used the Shure SM57 on tons of stuff, especially guitar amps. There was a great old Silvertone amp at the studio that Ezra and I used for our guitars. The guitar tones on the first album were all Fender Deluxe; the new album is a combination of Deluxe and Silvertone sounds. "After about a month of working at Treefort, we went on tour, and when we were in Mexico City we had some time off and decided to record some songs there. We ended up in the studio called Topetitud, owned by Tito Fuentes of the band Molotov. The studio also has Pro Tools HD, and Tito, who acted as engineer, had a bunch of API preamps and some outboard gear, like [Empirical Labs] Distressors, which he used on some of the snare tracks. 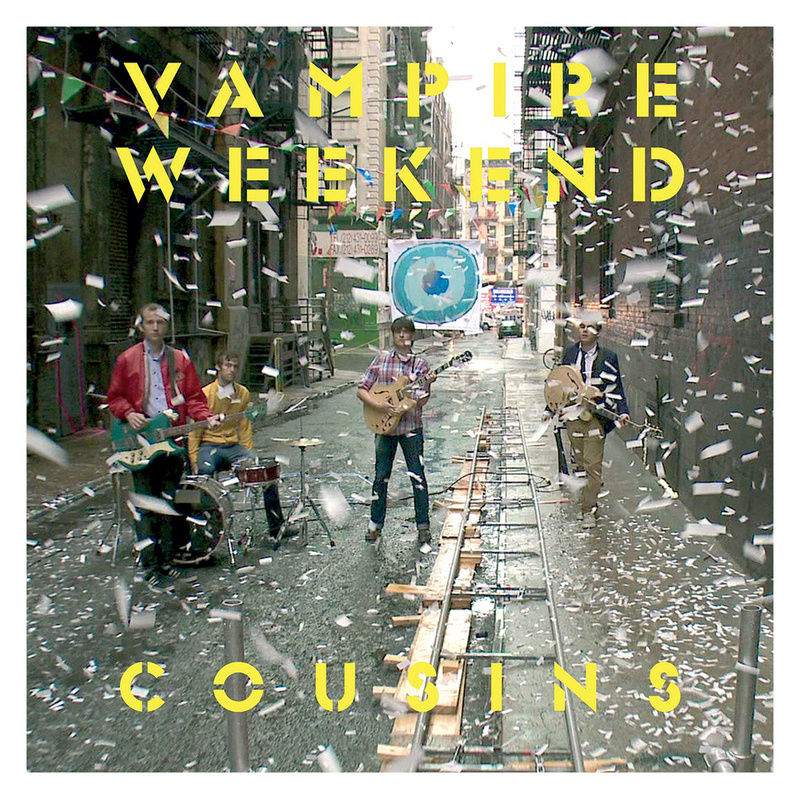 "One of the songs for which we recorded the backing tracks in Mexico was 'Cousins'. We recorded vocals, guitars, bass and drums to a click track. The drums were isolated in a pretty small, reflective room with lots of hardwood. The bass was in the control room and the guitars and vocals were done in another room. We recorded everything live and then re‑recorded on top of a comp of the best drum takes. Because the snare is such an important part of that song, I remember putting a couple of microphones on it, so we could pan it later on and make it as wide as it could be. We did the drums on the first day, and the next day we recorded bass and guitar. 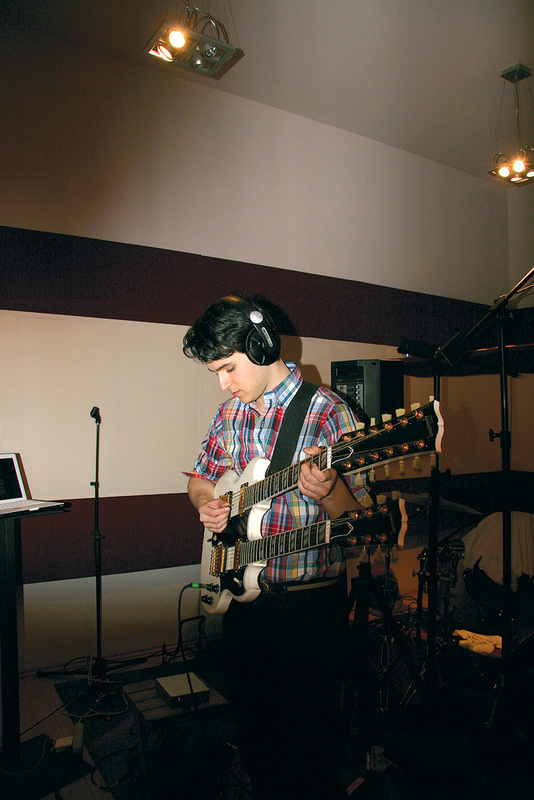 Tito had this awesome white double‑necked [Gibson] SG, and we used the 12‑string neck to record some of the guitars. That initial guitar that you hear on the track is played by Ezra through a Roland Jazz Chorus JC120, and I am using the chorus on the amplifier and miking the amp in stereo, one microphone for each speaker. "The track is very fast, and Chris and Chris wrote some of their most challenging parts as a rhythm section. Although almost everything is played, we did one real studio trick. We wanted some of the guitar parts to sound robotic and mechanical and plasticky, in the way that a lot of Mexican and Puerto Rican guitar tones are. So one riff was played at half speed, and using Pro Tools, we squeezed it in time exactly by half. Most of the guitars in this track were played by Ezra, but the bells part that comes in at the end was something I initially wrote on guitar, and was trying to put it on top of one of the verses. It was supposed to be like a Bob Dylan kind of guitar lick, but then I had a vision that it could sound like church bells at the end — coming in over what Chris and Chris called 'the Rage part', their tribute to Rage Against the Machine. So in one speaker there are tubular bells, and in the other speaker a celesta, and in the middle you have my distorted guitar line. This was all done in Mexico. Written by Biao, Batmanglij, Koenig, Tomson. 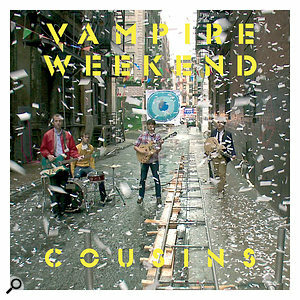 "'Cousins' is a raw track, and I added more distortion to some of the vocals and other instruments, but you can't distort plug‑ins in the same way as you can distort a piece of analogue gear. There are saturation plug‑ins that get close to the real thing, but if I'd tried to do all the distortion with plug‑ins, it would have sounded thin and I'd have had some popping and clicking. However, the band wanted to mix primarily in the box, so we could pull up any song at any time and work on it. Sometimes we'd work on one song for a couple of hours and then we'd open up another one. I therefore had to use hardware inserts for the outboard, and setting up routings for that obviously takes more time than just dialling up a plug‑in. "Personally, I prefer working on a desk, because I can get sounds a lot quicker, and also, I find it harder to get the same spatial depth when working in the box. A certain distance between the instruments is a lot easier to achieve when working on a console. I don't know why. Perhaps it's to do with the physical act of holding a fader or pan pot and moving it ever so slightly until it feels right. When you're mixing in the box it's also hard to ignore the visual aspect of it, because you're staring at a screen the whole time, instead of paying attention to what you're hearing. While I was mixing 'Cousins', I started working with the Mackie Universal Control, but it ended up frustrating me more than anything, because the faders didn't respond right away and it never reacted like an SSL or a Flying Faders system. In the end I used it only for the transport buttons. Drums: NI Battery, Waves Renaissance EQ & Q4, Bomb Factory BF76 & Fairchild 660, Digidesign EQ III & Expander/Gate III, PSP Vintage Warmer, Neve 33609, URS 610. Gerrish: "On the far left of the Mix window screenshot for 'Cousins', you can see the 'SnrTr' track, which was a snare-roll sample I loaded to help the song going into the choruses. I used the [NI] Battery sampler, which is on the track next to it, and the track next to that, 'Mstr1', is my stereo mix. To the right of that are all the main drum tracks. 'BD09' is the main bass drum track, which has quite a few plug‑ins, including the Renaissance 4‑band EQ, Digidesign EQ3, Waves Q4, and the Bomb Factory BF76 compressor. I find that I'm never really satisfied when I try to get the entire sound from one EQ, so I tend to use different EQs, each doing one thing. The '4409' track is another bass-drum mic with two EQ plug‑ins (I didn't use the greyed‑out plug‑ins). Then there are five snare tracks: 'SN09', 'BPRI' (the printed snare sample), '4210' (another snare mic), and 'snr05' (a pair of clean sidekick sounds), with Renaissance, Waves, and Digidesign EQ plug‑ins and the PSP Vintage Warmer, Expander/Gate III and a Fairchild 660 plug‑in. "To the right of the snare tracks are two tom tracks, with the Expander/Gate and a Renaissance EQ, and then 'SF09' and 'SFPRI' are the result of a stereo track that I got in the Session, which was called SF and which I assumed to be a Royer SF12 stereo ribbon mic. I wasn't sure if it was supposed to be a room mic or an overhead, because the two sides of the mic were not even — the left side was 12dB lower than the right and closer‑sounding. I split the track into two mono tracks and treated them differently, turning one into an overhead and the other into a room mic. I ran the 'SF09' track through my [Standard Audio] Level‑Or 500‑series outboard compressor, which is pretty noisy. I tend to use it as a distortion box. The '4211' next to that is the snare top mic, which I had duplicated to be able to treat it a little bit differently, using, again, EQ and PSP Vintage Warmer. Bass: Bomb Factory BF76, Neve EQ, Empirical Labs Distressor. Guitars: Waves Q4, Digidesign EQ III, Bomb Factory SansAmp PSA1 & BF76, Digidesign Pitch. Vocals: Universal Audio LA3A & 1176, Standard Audio Level‑Or, Digidesign Pitch, Bomb Factory BF76. Master bus: Universal Audio 1176, GML EQ, Massey L2007.